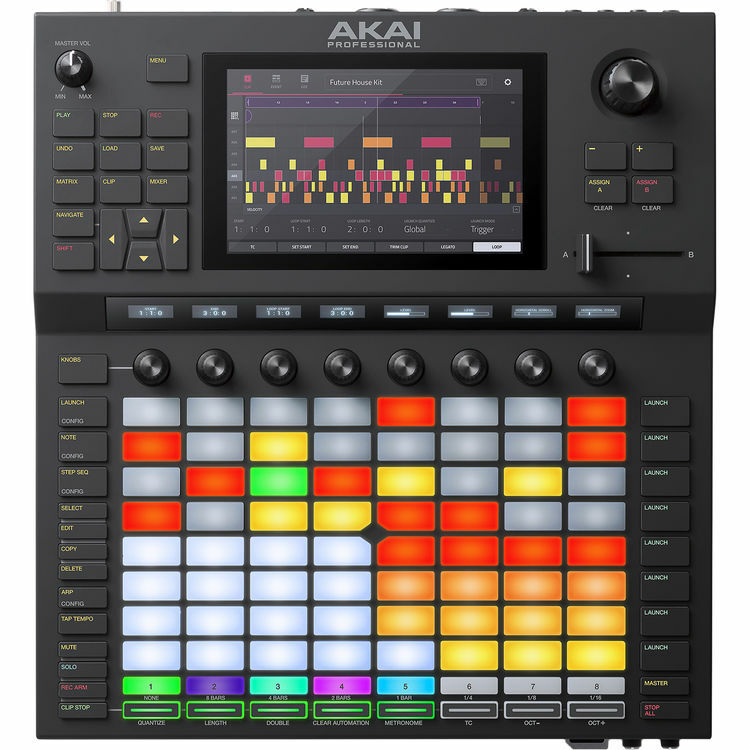 Just in time for NAMM 2019, Akai Professional—the famous manufacturer of the MPC—has made a big push into the world of computer-free music production. 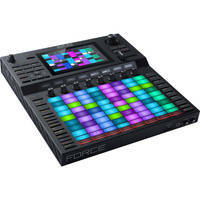 The Force bills itself as a stand-alone music production and DJ performance system, and that's just what it is: You can launch clips, play notes and chords, arpeggiate patterns, mix it all to your needs, easily trigger global effects, build entire live shows, and accomplish so much more with this handy device. 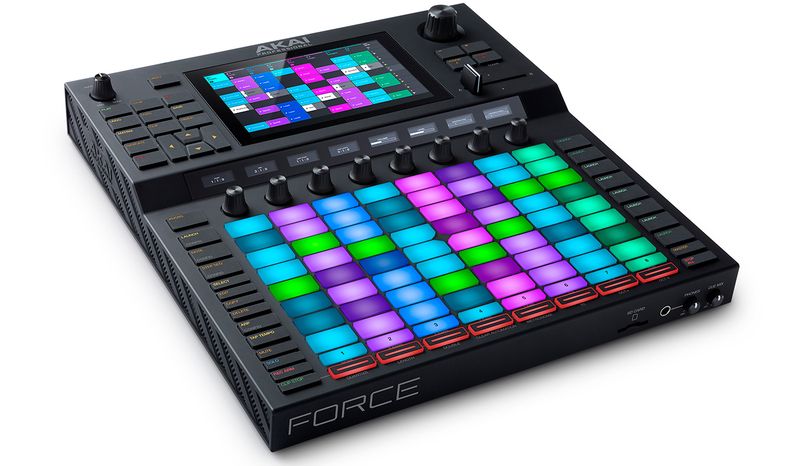 Indeed, think of the Force as a DAW, a controller, a playable synth, a sampler, and a mixing console, all stuffed into one transportable box. Check out its hardware: To the left of its intuitive touchscreen, you'll notice easy-to-use controls for navigating the unit, as well as transport controls, a volume knob, and a big prominent save button. To the right, you'll see a clickable encoder for selecting parameters. Note the assignable buttons, and the crossfader below the encoder—this crossfader is particularly useful for DJs. Let's examine the touchscreen itself, which provides multiple ways to lord control over your music. Multiple methods of examination on hand, from the matrix window to the clip view. Clip view gives you a detailed view of any bit of audio, showing you drums, a piano roll, or a waveform display for your audio samples. Chop, move, and reverse audio with ease! A comprehensive mixer view provides parameters like level, sends, pans, and inserts. You can switch tracks, access studio-quality effects, and even automate parameters. Of course, there's much, much more—but we need to move on! Below the touchscreen, you'll find eight capacitive touch-link controls. These can be mapped manually, or automatically configured. Assign functions like level, sends, panning, and more. Synth parameters map to the touch-link controls, as well, giving you the ability to tweak filters and LFOs. And now, the 8 x 8 grid of velocity-sensitive pads—64 in total! Use these to launch clips, play notes, "strum" chords, trigger drums, and engage the step sequencer. Here you'll also find controls for mute, solo, record arm, and other functions that will come in handy. We're already deep into this announcement, and we haven't even covered the panoply of possible connections, like XLR-1/4" combination jacks, 1/4" TRS and TS inputs, RCA pairs, cue-outputs, MIDI I/O, CV/Gate, and so much more. Soon, the unit will give you one-for-one over Ableton Live, so you can use this unit with Ableton if that's your preference. 10GB of samples are included off the bat, and you'll love features to help you quantize, warp, and loop functions. Really, we could go on and on, or we could just direct you to our SuperStore, where you can play one of these units yourself. Hope you enjoy!